There’s plenty to be excited about for the upcoming NBA season. Russ has new friends to play with. Kyrie gets to be “the man” in Boston. Giannis and Kawhi join the MVP discussion. Lonzo. The Process. LeBron and Wade together again. The Warriors and their star-smashing Line-up of Death. The SLAM PH team got together to add to that list. They wrote about why they’re personally excited for the return of the NBA. So, get hyped. The NBA is back! The 1980 NBA Finals. Philadelphia versus Los Angeles. Julius Erving versus Kareem Abdul-Jabbar. The Battle of the Titans had turned into a see-saw affair that ended up tied after four games. The Lakers won game five, but at the expense of losing Abdul-Jabbar due to an injury. Most people might had expected this game to be a different story, and they were right. Except that it didn’t become a Julius Erving show. A 20-year old rookie by the name of Magic Johnson took charge of the Lakers and gave a stellar performance: 42 points, 15 rebounds and seven assists. He stole the show from Erving and ran away with the 1980 championship. The myth of a 6’9 point guard who can play all five positions was born. Back then, fans did not know what to call players like Magic who are unique and exceptional. They just existed. But as the league is directed towards positionless basketball, more players who can take several positions on the floor are emerging. From this crop of players, a selected few are blessed enough to have exceptional physique, or otherworldly talent, or both: THE UNICORNS. Named after a mythical creature, these unicorns are the players who are so rare that their dominance in basketball defies human logic. Think about Magic Johnson, Pete Maravich, or even Charles Barkley who go in contrast to the norms, yet managed to carve roles for themselves. These guys are more than just once-in-a-generation talents, they are glitches who are not meant to exist, but existed anyway (to the delight of the fans). In modern-day NBA, the term unicorn is almost (ALMOST) used exclusively to the guys who are freakishly long in terms of height and wingspan, and can play multiple roles. They are rising in prominence due to their versatility on the floor, which is essential to positionless basketball. Guys like Kristaps, KAT, Giannis, KD and Dray fit into this category. As the 2017-2018 season draws near, let’s take a look at the burning questions surrounding these unicorns. 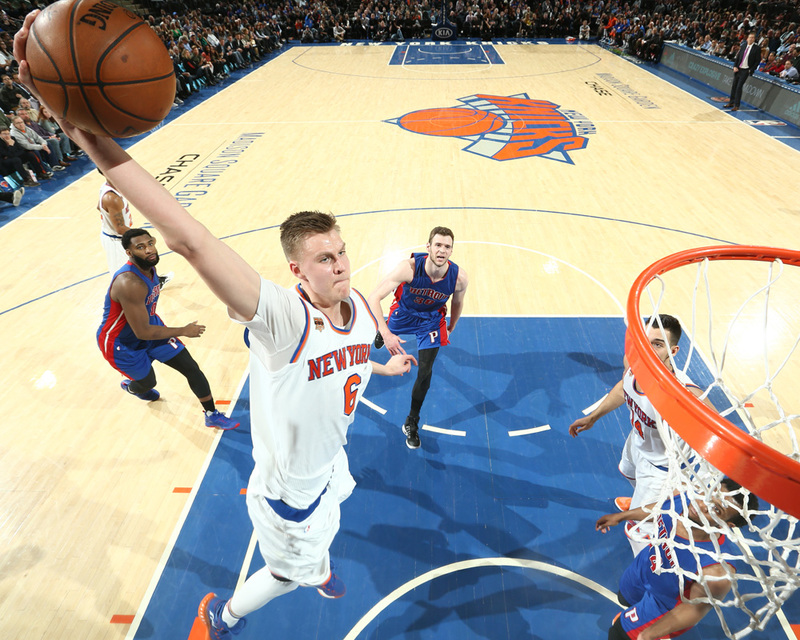 Can Kristaps be the main man in New York? For a fourth overall pick, Kristaps Porzingis was a relatively unknown commodity when he came over the NBA. With all of his out-of-this-world physical tools, KP looked more of a project rather than an outright impact player. He was a thin, lengthy guy who was presumably a copycat version of Dirk Nowitzki: a seven-foot European who can shoot from the outside. Two years and a few muscles added later, he is now the perfect unicorn specimen and the face of the New York Knicks. Last season, Kristaps played behind Melo and D-Rose. Despite being the third guy on offense, he still managed to score 18.1 points per game on 50.7 % effective field goal percentage. He also led the Knicks in rebounds (7.2) and blocks (2.0) per outing. He was also the team’s best defensive player in terms of defensive win shares (2.1). Now that Melo and D-Rose are gone, the floor is wide open for Kristaps to finally breakout. That brings us to the question: how good can Main Man Kristaps actually become? The answer might be found across another continent. During Eurobasket 2017, Kristaps led the Latvian national team in points (23.6), rebounds (5.9), and blocks (1.9) per game. He was also Latvia’s best performer in terms of efficiency (23.4) while playing 27.2 minutes per outing, which is way below his NBA’s per game average of 32.8 minutes. If anything, Eurobasket Kristaps could be a preview of what NBA Kristaps will be: a walking mismatch on offense. He has an array of moves that covers up to the three-point area. His speed, length and shooting touch can make any defender pay for giving up even the slightest opening. Sure, the Knicks are still trapped financially (Hello, Joakim and Tim). But they are goddamn lucky Phil Jackson picked Kristaps over anyone else. With no one else to turn to, New York is now KP’s team, and the unicorn from Latvia is poised to dominate the basketball scene in the Big Apple. Can Karl Anthony-Towns bring the Minnesota Timberwolves back to the playoffs? The last time the Minnesota Timberwolves reached the playoffs was in 2004. Kevin Garnett was the team’s main man. Sam Cassell was the floor general, and Latrell Sprewell was revving his Spinners. Back then, Karl Anthony-Towns was just an eight-year old kid who was probably watching KG revolutionize the 4 position. Thirteen years later, he is now leading the stretch 5 revolution while trying to bring the Timberwolves back to the postseason. Last season, the 2015 number one pick led his team in scoring (25.1), rebounds (12.7) and blocks (1.3) per game. As per ESPN, he was one of the four qualified centers who averaged at least one three point shot made per game (Brook Lopez, Marc Gasol, and Al Horford being the other three). 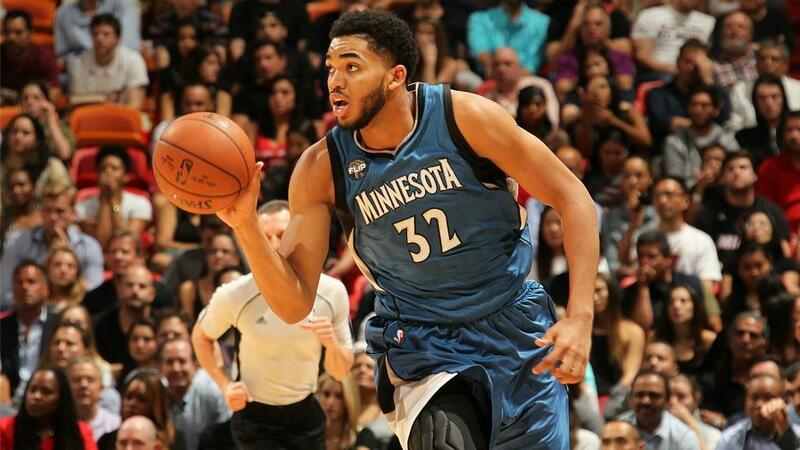 With an improved supporting cast, KAT might not need to do so much this season. But even with the acquisition of Jimmy Butler, Jamal Crawford and Taj Gibson, Towns will still be the best player of the Wolves on both ends of the floor. On offense, his flawless shooting mechanics and explosive dribble drive makes him look like a wing player that possessed a seven-foot body. His wide array of offensive skillset makes him troublesome to defend, especially with slower bigs. On defense, his quick reflexes combined with his length enables him to block shots from anywhere on the floor, even on guards after a switch. In order to reach the playoffs, the Wolves will still need KAT to elevate his level of play, which is almost certain given that he is only 21 years old. Minnesota hinged its future on Towns—the upcoming season might be the best time to start cashing in on that future. Can Giannis Antetokounmpo win the MVP? Ah, the most majestic of all the young unicorns. It’s hard not to gush over the 6’11 small forward/point guard/whatever position you want to put him out of Greece. Giannis’s 7’0 wingspan has been at the forefront of Jason Kidd’s “the longer, the better” principle ever since he assumed coaching in 2014. 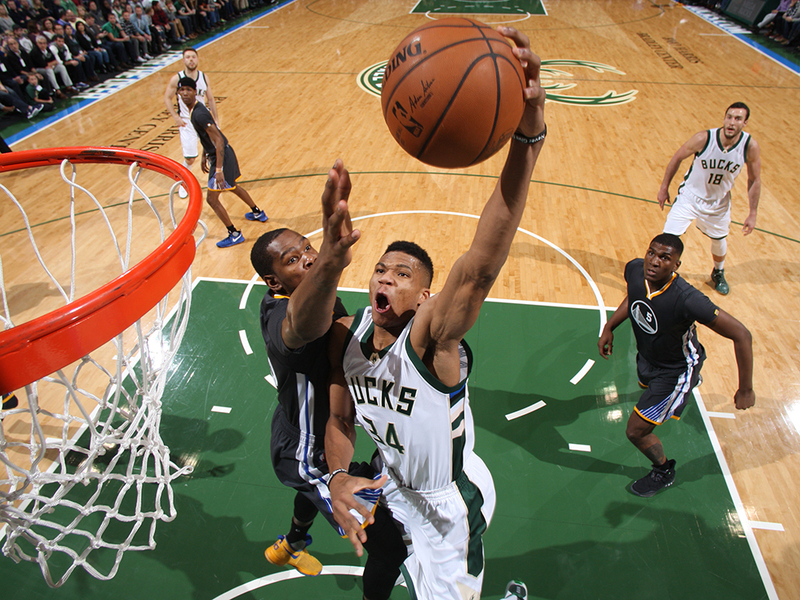 The 22-year old ‘Greek Freak’ made leaps in his production year after year, and the NBA took notice as he was named the 2017 Most Improved Player. But beyond those physical tools is a skillset that made him one of the best among the band of unicorns. In 2016-2017 season, Giannis shot 70 percent from three feet within the basket (as per Basketball-Reference.com). He took most of his shots close to the hoop, and for a good reason. He is a player who towered over guards and forwards, yet easily blitzed through the usual bigs. His long legs enabled him to go from the arc to the paint in just two to three huge strides. He was also the Bucks’ best defensive player last season. He led the team in steals (1.6), blocks (1.9), defensive rebounds (7.0) and defensive win shares (4.5). His 22.9-8.8-5.4-1.6-1.9 stat was MVP worthy. But for Giannis to be seriously considered in the MVP race, he needs to improve his shooting from beyond three feet within the basket. His percentage dropped to less than 40% when shooting farther from the hoop. There is also a significant decrease in percentage with increasing shot distance (as per Basketball-Reference.com). In his four seasons, he shot over 30 percent from beyond the arc only during his rookie year. Last year, he was able to convert only 27 percent of his three point attempts. If he can convert his long range bombs more often, then he will be virtually unstoppable on offense. But with his continuous rise, it’s not anymore a question of whether or not Giannis can win an MVP—it’s when. 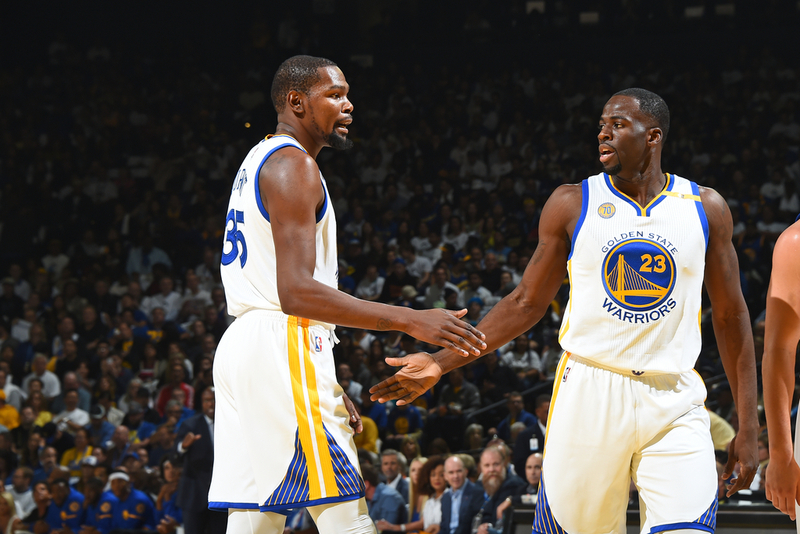 Are Kevin Durant and Draymond Green the best frontcourt duo in the NBA today? The Warriors’ small ball lineup of Steph, Klay, Andre, Harrison and Draymond was notorious for killing opponents’ defenses with three point shooting—thus the moniker ‘Death Lineup’. GSW did not give up so much on defense because of the omnipresence of Dray, a unicorn in his own right. Unlike others, he is a relatively undersized power forward at 6’8”. But man, this guy is a living anomaly with his defense that looks like he’s patrolling all over the floor. He is a Swiss army knife on both ends, one who doesn’t need to score to fill up the stat sheet. But after the painful loss against the Cavs in the 2016 NBA Finals, the Warriors’ front office decided that their Death Lineup wasn’t deadly enough, so they replaced Barnes with Kevin Durant. The Warriors somehow found a way to trade their V3 rocket launcher into a fleet of Kirov airships (pardon the Red Alert 2 reference). But it’s not like the Warriors solely benefitted from having KD. With the Dubs, the 2014 NBA MVP reinvented his game into a far greater, far scarier ‘Slim Reaper’ form. KD’s transformation seemed to have reached its peak during Game 2 of the 2017 NBA Finals. Draymond Green went into foul trouble and Durant was tasked to play center. At first look, it was a certain recipe for disaster, as his thin frame would be beaten up by the likes of LeBron, Love and Thompson. But he rose to the occasion and anchored the Warriors’ defense for a short sprint, which resulted to the team’s second win of the series. One game is really short, but it’s enough to make anyone imagine: Are KD and Dray the best 4-5 duo on the court? The Golden State Warriors have the luxury to install two unicorns to lead the frontcourt of its small lineups. KD and Dray possess unique skills, both on offense and defense, which go against the grain of traditional NBA bigs. Draymond’s defense has been known in the NBA for a few years now. Last season, he led the league in steals (2.0), and was second to Rudy Gobert (6.0) in terms of defensive shares (5.4). He also did his usual stat-sheet stuffing with averages of 10.2 points, 7.9 rebounds, 7.0 assists and 1.4 blocks per outing. As for Durant, don’t let his non-inclusion to any of the All-NBA Defensive teams throughout his career fool you into thinking that he is not a top-tier two-way superstar. He was last season’s top shot blocker (1.6) and rebounder (8.3) for Golden State. He did not slack on offense either. Despite the significant dip in scoring (25.8, his 2nd lowest season average), he had his most efficient season in terms of field goal percentage (53.7) and turnovers per game (2.2). When facing the Dubs, opponents have to deal with two players who have the mobility to patrol on defense. KD and Dray can initiate continuous switching to prevent mismatches. Opponents will now have to worry about getting locked in by these guys who constantly look for their next prey. These two also are potent offensive weapons. Opponents will have to deal with either letting KD and Dray drag the bigs into the perimeter, or switching a quicker defender on them at the risk of creating a height mismatch. Sagging off is a mortal sin, as both of them shot decently from the three (KD shot 37.5%, Dray shot 30.8%), and from the field in general (KD shot 53.7%, Dray shot 41.8%). They also combined for 833 of 2491 (33.3%) assists made by the Warriors in the regular season, which is a testament on their importance to the flow of Golden State’s offense. Are KD and Dray the best 4-5 duo in the NBA? That is still up for debate. There is only one thing certain in this whole scenario—GSW’s Death Lineup has its best iteration yet with have KD and Dray manning the paint.